Instead of dwelling on God’s wrath, we need to understand God’s kindness and mercy. It’s been a time of calamities: Hurricanes Harvey and Irma, flooding in South Asia and Africa and a massive earthquake in Mexico have led to widespread devastation around the globe. Others disagreed over the reasons for God’s anger, but not necessarily with the assumption that God can be wrathful. Jennifer Lawrence suggested that Irma was “mother nature’s rage and wrath” at America for electing Donald Trump. It is true that many religious traditions, including Judaism and Christianity, have seen natural disasters as divine punishment. But, as a scholar of religion, I would argue that things aren’t that simple. Some of the earliest narratives of divine retribution go back to 2000 B.C. The Sumerian Epic of Gilgamesh tells the story of a catastrophic flood. The gods decide to bring rain down to end the “uproar” of humankind. But the god of the waters, Enki, warns the righteous man, Utnapishtim, about the impending disaster. Utnapishtim saves himself and his family by constructing a boat. Noah is a “blameless” man, and God tells him to build an ark that would be large enough to hold his family and “two of all living creatures.” Although humanity perishes in a deluge, Noah preserves life on Earth. It might seem straightforward to say that natural disasters in the Bible are associated with God’s anger, but that means missing the complexity of the text. God makes a covenant with Noah. The question of God’s anger is intimately connected to the problem of human suffering. 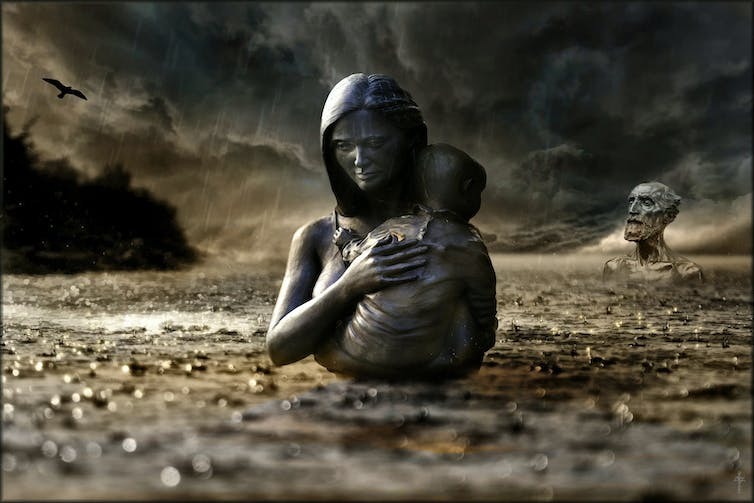 After all, how can a loving God cause indiscriminate human misery? We first need to look at how suffering is portrayed in the texts. For example, it is also in the Book of Isaiah that we find the story of the “Man of Sorrows” – a man who takes on the sufferings of others and is an image of piety. While the Bible does speak of humans suffering because of their sins, some of the most moving passages speak about how innocent people suffer as well. The Book of Job relates the story of a “blameless and upright man,” Job, whom Satan causes to experience all sorts of calamities. The suffering becomes so intense that Job wishes he had never been born. God then speaks from the heavens and explains to Job that God’s ways surpass human understanding. The Hebrew Bible recognizes that people suffer often through no fault of their own. Most famously, Psalm 42 is an extended lament about suffering that nonetheless concludes by praising God. The Hebrew Bible’s views on suffering cannot be encapsulated by a single message. Sometimes suffering is caused by God, sometimes by Satan and sometimes by other human beings. But sometimes the purpose behind suffering remains hidden. The Christian tradition also provides diverse answers to the issue of suffering. The Christian tradition provides diverse views on suffering. The New Testament does refer to the Genesis flood when talking about God punishing human beings. For example, Paul the Apostle observes that God brought the flood on “the ungodly” people of the world. Earthquakes are also mentioned as signs of the end of time in the Bible’s Book of Revelation. But the Epistle of James, a letter in the New Testament often attributed to Jesus’ brother or stepbrother, says that God tests no one. In fact, those who endure trials are eventually rewarded. The early Christian philosopher Origen argued that through suffering we can understand our own weaknesses and dependence on God. In these views, suffering is not punishment but something that draws human beings to closer God and to one another. 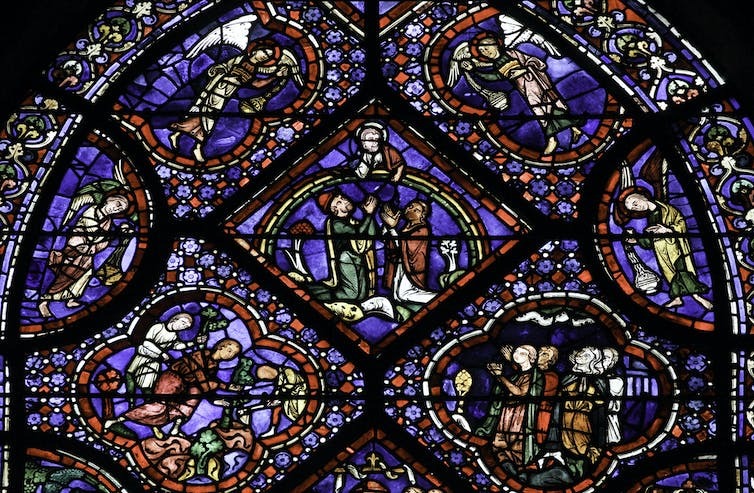 Moving to more contemporary reflections, philosopher Dewi Zephaniah Phillips argues that it is mistaken to attribute to God a human feeling like anger because God lies beyond human reality. Believing that hurricanes, floods, and earthquakes are “God’s punishment” reduces the divine to human terms. Some theologians totally reject the idea of suffering as divine retribution because such an act would be unworthy of a merciful God. From a Christian perspective, God also suffered by being crucified on the cross as Jesus Christ. And so, as a Roman Catholic scholar, I would argue that God suffers with people in Texas and Florida – as well as with those in India, Nepal, Bangladesh, parts of Africa and Mexico. So, instead of dwelling on God’s wrath, we need to understand God’s kindness and mercy. And that, in times of crises and distress, it is kindness and mercy that require us to reach out to those who need comfort and assistance. This is an updated version of a piece originally published on Sept. 6, 2017. God of compassion, your Son died on the Cross so that by his broken body our divisions might be destroyed. 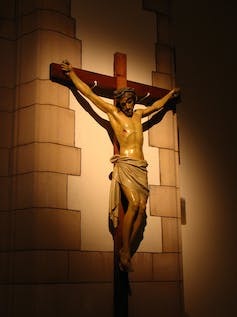 Yet we have crucified him again and again with our disunity, and with systems and practices which obstruct your loving care and undermine your justice towards those who have been excluded from the gifts of your creation. Send us your Spirit to breathe life and healing into our brokenness that we may witness together to the justice and love of Christ. Walk with us towards that day when we can share in the one bread and the one cup at the common table. God of life, lead us to justice and peace. Amen. On Sunday, October 7, 2012 we began reading from the Book of Job in our worship (which uses the Revised Common Lectionary to inform scripture choices for our Sunday worship). We will continue to read from this book for the remaining Sundays in October. Among the themes explored in this ‘parable’ are good, evil, God, creation, fate, suffering, pain, faith, doubt, lament, praise, and more. Here are some of today’s sounds in the Wind Chimes as we explore the Book of Job. The questions of Job, the responses of Job’s friends, Job’s own response to his plight, the role of God in deprivation, suffering, and pain, the presence of God in the midst of these things, are not just parts of an ancient story but contemporary questions (“perennial questions”) of folks like you me, questions addressed to the Church. So what do we learn from Job and what do we hear the Spirit singing in the chimes? If everyone’s life is a book, and every day a page, then there are some days that deserve to be dog-eared. Your high school graduation, your wedding day, the birth of your children, and the day that your doctor discusses cancer with you for the first time. If you are a caregiver, or about to be one, this book can hopefully shortcut the learning curve that sliced me to shreds. This book is the story of my wife’s cancer and our journey through the medical system that eventually led us to one of the most cutting edge, lifesaving surgeries on earth. 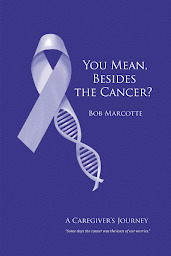 —Bob Marcotte introducing You Mean Besides the Cancer? I am proud to call Bob and Carole Marcotte my friends. Carole is living with cancer. Bob is her primary caregiver. Bob has journaled his thoughts and made them available to others in his book and his blog You mean besides the cancer? I encourage you to explore (and buy) the book. O come and smite again thine enemy. And to the tired and ill give quietness. Come near, that even so they may have peace. Just before we leave the Second Week of Easter let us take one more look at Thomas. Steve Garnaas-Holmes is a United Methodist minister who writes daily. I am grateful for his insights and his willingness to share. Here, I have excerpted his meditation “Unless I see the marks.” You will want to read the entire meditation (more than once). It has opened my eyes to see Thomas in a different light. the way he always did. Read the entire meditation: Unless I see the marks « Unfolding Light.